First up though, here are our four most recent podcasts which take us through from late March into the first week or so of April; they're quite a diverse batch of shows too! ADVENTURES FROM THE YETI ARCHIVES! Here we are for episode 239! In a change to our scheduled episode, Cuthbert has questions for Paul about filming his show, "Sutton Park" back in 1998 - and once Paul gets started there is no stopping him! Our next episode, #240 sees us listening in on a fascinating conversation between Nick and his mum recorded back in April 2018. Do join us, won't you?! Please email me at shyyeti@yahoo.co.uk if you have any comments - you can even send me a sound-file and I'll include it on the show. The music is by Shy Yeti, Harry F and Luca. Sound effects by Paul Chandler. All content is Copyright Paul Chandler, 2019. Episode 239 was recorded on Saturday 23rd March 2019, with Sutton Park clips taken from episodes 2110-2120, recorded between 25th April to 1st May 1998. Here we are for episode 240! In the UK, as we near Mother's Day 2019, old friend of the show Nick Goodman chats with us in late 2018 and shares a conversation that he recorded with his mum on the 18th April 2018, just a few months before her passing in July 2018. Thank you to Nick for allowing me to use this interview. Our next episode, #241 sees us beginning the new month with an April Fool's prank - how will it all pan out!?! Do join us, won't you?! Please email me at shyyeti@yahoo.co.uk if you have any comments - you can even send me a sound-file and I'll include it on the show. The music is by Shy Yeti and Luca. Sound effects by Paul Chandler. All content of this episode is Copyright Paul Chandler and Nick Goodman, 2019. The interview in this edition was recorded on 18th April 2018, with show links recorded on the 8th December 2018. Next up - we enter April with a bang by looking into the future to see what is and isn't there! This one went under the alternate title of CROMITTY AND THE CRYSTAL BALL for a while - but when it came time to release it I reverted to the working title as it had actually been referred to in the episode. Our next episode sees us heading to Venice for the first time in 2019 - to begin with we're just having a little catch up! Next up I am excited to be able to tell you more about my forthcoming collection of poems and prose! Here are the 53 pieces (poems and flash prose) that make up the new book - they all made their debut on the blog between 2015 and 2017, but many have since been slightly reworked. IF I COULD LIVE TO BE FOUR HUNDRED!! Next time we'll be sharing with you a script from a forthcoming episode of the podcast - which should be out around the time that the post is released! This time we discuss a true-life ghost story that Paul recently received from his old friend Andrew D. - the story is shared and the regulars chip in with their opinions... It's a scary little show! Paul has been asked to sing his friend Harry's song as a big concert - it's scary enough that it's going to be live, but now he's lost his voice! Can Ikk and the gang help him get through it and will anyone notice if they pull a few lip-syncing tricks!? 245. Stop! 1980... Beams Are Going To Find You! Paul and Nick discuss the big hits of 1980 and also jump a few years forward to compare two of the biggest bands of the mid to late 1980s who are still around making new music in 2019! 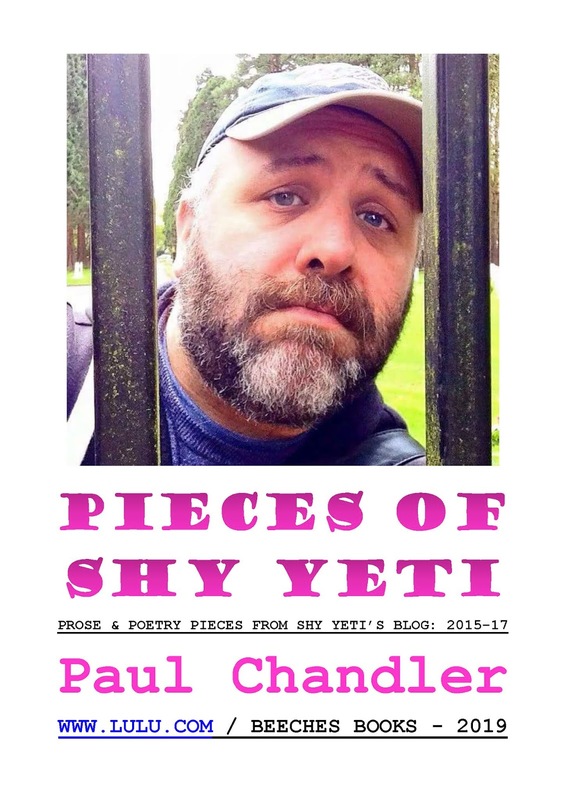 It is Easter Sunday and Paul is about to launch his new book, PIECES OF SHY YETI with help from all those in the chat-room! 248. Charlie Grrr and The Pie With The Pastry Plumage! If all goes to plan with a trip to Venice in May then I plan to a record a pie-related giallo spoof with Charlie Grrr and some of the other regulars! I can promise that it'll be super silly. There is bad feeling in Shy Life Podcast-land when a light-hearted popularity contest to celebrate 3 years of the show goes badly wrong and the results are declared as "the will of the people"! Is this true or have the results been rigged!?! Ikk also recalls when time travel was almost used to fix the results of the Big Fatty Online Number 1 Fan contest! Mr Yeti celebrates 3 years of the show in our live Pride48 show for May 2019! Paul catches up with Nick and Andy to discuss the big hits in film of 1987 - they also discuss James Bond as 1987 was the year that the franchise got a new face! 253. Shy Yeti Is Making His Mind Up! Paul and Nick discuss the big hits of 1981 in both the UK and the US! Cuthbert accidentally downloads a free Pickle Hollow app whilst downloading old episodes of The Smellcast and although it starts off kinda cute it gets old very quickly when random voices from the show start to fill the air. How do they delete it? Can Toppie help? Mr Yeti and Toppie Smellie team up to entertain the listeners with their very own brand of mad-cap comedy! What more could one ask for!? ### The Dragon And The Cacti! ### The Truth About The Murder Mystery Weekend! ### Shy Yeti And The Ridiculous Sponsor! Paul and Toppie Smellie do a show together - but thanks to interference from Paul's new manager they have to keep stopping to do live adverts for the ridiculous sponsors they've been set up with! ### Behind The Scenes - Fiction Within Fiction! Paul looks back at how he used to film Sutton Park behind the scenes on some of Nick's films - with clips from both Tide Of Freedom and Evil Trophy and the equally as dramatic Sutton Park episodes recorded during these productions. 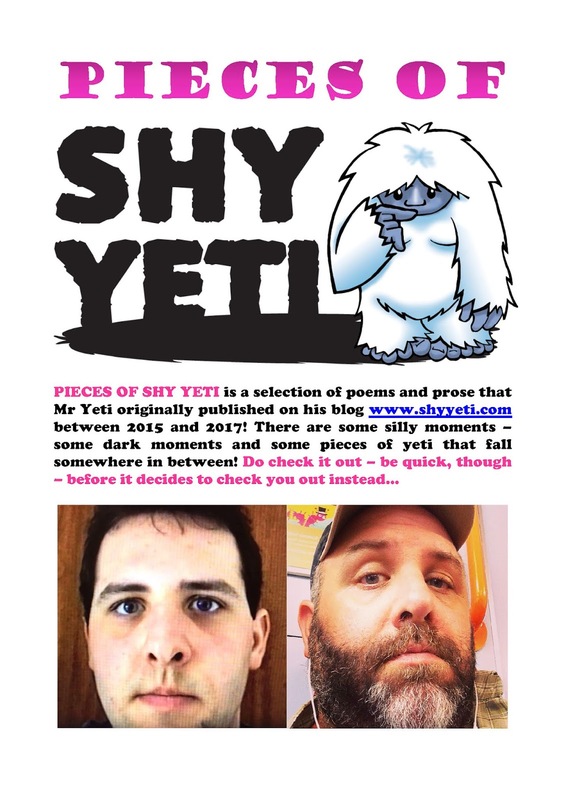 ### Shy Yeti's Cornish Adventure! ### Shy Yeti's Isle Of Wight Diary! ### Shy Yeti Gets Back To Scotland! ### Shy Yeti's Summer Retreat! ### Shy Yeti's Three Birthday Treats! Paul shares his birthday diary with the listeners as he and Toby head off into the wilds of the UK for his birthday! Things are getting out of hand with his manager and Paul has some very shocking news! Can Mr Trowbridge be of any help?